4. we've also been told to use copper sulphate and scrubbing to get rid of the black algae, though we also have some Bayrol Desalgin we were going to try first - I suspect all the products are different here than in the US, but it says its a "liquid algaecide with a broadband effect against all kinds of algae"
I apologise if I am repeating advice already given, and also if I sound ignorant of the issues (I am!) but would appreciate any help at this point as it all seems to be becoming a bit overwhelming...neither my husband or I have ever had a pool before and we're so busy getting everything packed and prepared to be ready to leave in time, and we just get really confused by all the seemingly contradictory info available... :? :? :? Re: I've had it with Ecosmarte!!! Hi and welcome to TFP! The advice we gave to lightly (the original poster on this topic) may not necessarily apply to you. I understand that you have very limited time available, but if you could get a sample of your pool water tested and post the results we can give you information more specific to your pool. Also I will ask a moderator to start a new topic for your question so the rest of us don't get your information and lightly's information mixed up. The test result is important so we will know how much water you need to drain, and if you will need a sequesterant for the copper. Since your caretaker is not familiar with pools, I would recommend you get a high quality test kit and have him learn how to use it. You will need to keep the pool at shock level and brush it daily, paying special attention to the black algae spots until the pool passes the overnight test. Also you may want to consider an investment in a saltwater chlorine generator (SWG) for your pool after the algae is cleared. When the system is in place timers will control when the pump and SWG run and the chlorine levels should stay steady. I would not use the algaecide. Many algaecides also contain copper, and they are not very effective against an algae outbreak, they are more for prevention. A pool that is properly sanitized with chlorine will not need algaecide. I also would not use the tablets, as they will also cause problems over time. Tablets contain either CYA (also known as stabilizer or conditioner) or calcium hypochlorite. You need to keep the CYA between 30-50 ppm (or 70 ppm if you use a SWG). Using tablets as a source of chlorine will cause the CYA to rise too high over time. Excessive CYA causes increased chlorine demand to sanitize the pool and can only be removed by draining and refilling with fresh water. Calcium hypochlorite also builds up in the water over time. Excess calcium (over 350 ppm) can lead to scale formation and cloudy water. Excess calcium also requires draining and replacing water to correct. A plaster surfaced pool does need calcium, but the calcium must stay within the recommended range to balance the water. We usually recommend maintaining chlorine levels with liquid chlorine, either unscented 6% bleach available in most stores or stronger concentrations from pool stores. Liquid chlorine does not add calcium or CYA to the water, but it does require frequent additions of chlorine (usually every other day) to stay within recommended levels. A SWG would be good for your situation since it automates the production and delivery of chlorine, and usually just requires monitoring to make sure everything is in working order. I have thrown a lot of information at you, and I know time is critical for you right now, but I wanted to give you enough basic information so you can decide how to proceed with your pool. Accurate test results are critical to determining what your next step should be. If you can provide that information, then one of us can advise you what to do next. I'm sorry you have a family emergency to deal with and I hope all is soon well with your family. Ok, so you have black algae, one of the few things that can help in a black algae attack is copper so you really need to get some test information for your water. Regular quaternary ammonium algaecide will do nothing against black algae so save your money. 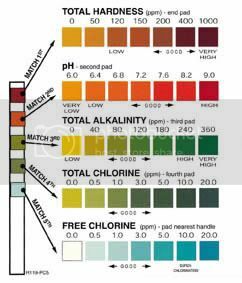 My sugestion would be to lower your PH to 6.5-6.8 where the copper is safer and you get a much more powerful effect from chlorine and shock the pool 5-10ppm you get things moving but watch the PH you can always raise the PH back up afterwards. You won't have any cyanuric acid in the pool as you have been using the Ecosmarte so using chlorine that has (Sodium dichlor/trichlor what ever your pool shop stocks )will be good for you for a while. The best time for you to shock the pool is when the sun has gone down in the evening as the chlorine won't be so readily burnt off by the sun's U.V. and you need to scrub the stains. Get those water figures and report back. Thank you very much for your quick responses - I really appreciate the help...I"m not sure which test results you need, but the copper is ph at 7.0 - we keep it between 6.8 and 7.2 as advised by ecosmarte (it has fluctuated between those figures all summer but very rarely gone above 7.2 and when it has it's not got further than 7.4 very briefly - we test twice a week, more if we have to top up the pool or if we have lots of rain, and add ph reducer as soon as it gets up towards 7.2.) The copper is at 0.6, again as advised by ecosmarte and it's been steady at that all summer. The chlorine is at 0 as expected as we don't use any right now, and the 'total hardness' which is the only other thing we've been told to test for by ecosmarte is at somewhere between 200-250ppm (my tester sticks are very vague!) This is too low - I have to say I'm shocked to discover that my husband (who 'looks after' the pool) said we don't have any hardness increaser as it's not sold around here and he hasn't been able to get the ecosmarte rep to sell him any, so he just left it at around 250ppm at the beginning of the season because he thought this would be an acceptable level (he says ecosmarte say you don't have to test it after the beginning of the season...) So...I'm now worried this could have affected the system and that we've brought it all on ourselves - as ecosmarte say the hardness should be 300-400. I'm going to read the pool guide on here to see If there's any other things I should be testing for - please excuse my ignorance but I'm in the process of packing and organising the move and now realise I'm going to have to sort the pool out as well which I know very little about!!! teapot - I will look into the SWG right now thank you - the only reason we were going to use the tablets (which I think are 4 in 1 as they have yet more chemicals in to stop the cloudiness etc as well - not my preference, but it is for rental now not for us) is that the guy who will be managing our house as a holiday rental while we are in the uk uses them in his pool and was keen to introduce them to us - presumably due to the ease of use! We were attracted to them as we're now short of money having spent so much more than expected on the pool (long story - other problems too!) and as we have to now rent a house in the UK unexpectedly too. But I'm sure you're right that it's better to get the system that works effectively and avoid future possible expensive and difficult problems if possible so I'll see if I can find an affordable SWG system - thank you again for the help! The two things that are confusing me right now though are: is CYA the same as cyanuric acid? If so, does this mean that teapot thinks we should be able to use the tablets for a while without problems because it doesn't have any in it at the moment? Especially if we get the CYA level checked regularly and reconsider if it begins to rise too much? (My husband is adamant that we should use the tablets as the guy who will be looking after our pool is a hotelier who has a small hotel with pool nearby and who has been running his own pool with these tablets for some years - though I'm now concerned about the potential problems raised by zea3). The second thing is - am I right in thinking you are both saying we should concentrate on shocking the water with chlorine shock once the copper is low enough to allow this without staining, and that we should keep the chlorine at shock levels until the algae has gone (while brushing the sides/floor daily)? Thanks again for all the help and sorry if I'm sounding a bit confused - my mum is very ill in the UK which is why we need to go back and it's not easy to concentrate on how to sort this out too, so advice is gratefully received! I'm not at all a fan of EcoSmarte. Copper alone is not enough to keep the pool sanitary and if you ever let the PH get too high (which it will tend to do on it's own if you don't monitor it) you will get unsightly stains that are difficult to remove. Yes, CYA and cyanuric acid are the same thing. If your starting CYA level is around zero, which it presumably is, it would be fine to use tablets for a while. Tablets tend to drive the CYA level up too high, but that takes a while to happen and can be avoided by doing enough water replacement. Shocking a pool with chlorine while you have copper at 0.6 can cause even more staining. Using some chlorine is fine, but shock levels will tend to bring on stains. Your best choice is to get the copper level down to 0.3 or lower first and then shock the pool. Your other alternative is to use a sequestrant to lock up the copper so it can't cause stains, but sequestrant can get expensive. I understand your predicament and the need to concentrate on the most important issues. As Jason says adding chlorine at shock level can produce copper stains, personally 0.6ppm is not too bad above that it would be a no no. If you want to play it safe then partially draining and fresh top up will be the quickest way but you could use some of that copper to help the fight against black algae 0.4ppm should be ok. I still feel you should reduce your PH whilst carrying out the remedial work unless you have a lot of metal fittings pool ladder returns etc which can cause corrosion of those so it maybe worth removing the ladder temporarily. Then for safety of staining lower your PH to 6.5 and make sure it stays on the low side. Ecosmarte wouldn't tell you not to use it but there are very good reasons (staining) why it should never be used in concrete/plaster/tiled pools, vinyl liner pools generally come out better if controlled carefully as you do. Ecosmarte systems all work for a while but as time goes on owners start having problems as the build up of organics climbs higher, the system does not oxidise enough or produce enough oxy radicals and they only last a minute anyway to keep your pool safe. Once you have conquered this battle remove the Ecosmarte and follow BBB as taught on TFP. Do not rely on multi action tablets too long as you will over do it with the cyanuric acid (CYA) if your multi action tablets have blue flecks in them then you are adding more copper so be careful, you may need to drain down more water to compensate. Liquid sodium hypochlorite is much quicker as it mixes within an hour and is already working whereas tablets take time to dissolve. Very concerned that a Hotel is using multi action tablets that cannot maintain the correct free chlorine level if too many people enter the pool at once. they should have direct chemical dosing via a chemical controller. Remove the Ecosmarte. There is nothing helpful or smart about it. Nor is it ecologically conscientious. A SWG is a great choice if you can go that route. A SWG will maintain a very consistent chlorine level which is ideal for a rental property situation. Your suggestion of pH lowered to 6.5 doesn't seem practicable. How should OP test for it? Testing that low is generally not available here in the states. Once the black algae has been destroyed then the usual pool parameters can be used this is only as an emergency temporary measure. In this case short term treatment test strips often go to 6.0 PH so are suitable. I am not aware of these. Are they commonly available in the US? Standard litmus paper tests are generally available, ask the science dept at any school for a couple. Encouraging the use of test strips just doesn't seem like a good option to me. This entire forum is dedicated to accurate testing....a cornerstone of BBB. Suggesting test strips as a remedy for a complex issue seems like a recipe for potential disaster and a suggestion I would consider w-a-a-a-y outside mainstream. I am not saying it won't work. What I am suggesting is that this forum is probably not the best venue for that advice. Whilst I do agree with you for the most part, the litmus test for testing the PH of liquids is very tried and tested and that part of the test strip is reasonably accurate whereas CYA, chlorine, TA and hardness are very un reliable. I am ONLY promoting the use in this urgent case and they are not the remedy, just a valuable part of the monitoring process. The only alternative is to empty the pool acid clean and destroy the algae and re-fill and follow TFP and BBB. Long term They should follow that regime it works. Thank you very much for all your comments and advice - our problem is that to reduce the ph to below 6.8 (the lowest our tester will detect) would take several days of adding ph reducer, as if we partially drain and refill the pool to lower the copper then that will raise the ph (refilling from our tap always raises the ph) and we can only reduce the ph by a small amount at a time or my husband says we'll get 'ph bounce and all sorts of problems...'. If we do that then won't the pool start to get more algae and dirt as there is nothing sanitising it for the several days it will take to get the ph down? Will that not be a problem? We could probably just about manage to get the copper and ph to the right levels to start shocking the pool before we have to leave, but as we leave in 1 week's time it's really cutting it fine. May I ask how we should go about getting rid of the black algae if we just drained the pool and started again? Is there a product that we could use while the pool is empty? In the past the pool has been 'acid washed' (though that was before they put the tiles on) is that an option for this situation? Or can we use a solution of copper sulphate to scrub the pool? (we were told that's the best thing to get rid of the algae by a local pool company but they were referring to using it a solution in the water itself, which we are not sure about now given the advice we've been given here about shocking it instead). Sorry to be such a beginner - I've been trying to read up on the issues but I'm totally overwhelmed by all of the info on the forum as I have so little time to solve the problem right now - if we could find a pool company we trusted to sort it I would just hand it over to them but there don't seem to be any around here!!! Lastly - the hotelier I referred to actually runs a very small hotel in our village and the maximum number of people in the pool at one time is likely to be about 6! So I guess he uses that system as the pool often goes unused for long periods - it's not a busy hotel and only has a few rooms. But I don't like the thought of using it myself, and would only let him use it here in the short term until we can organise getting a SWG fitted - though now I'm struggling to find one here - my last question is: is SWG the same thing as Salt Water Electrolysis and can anyone recommend a good, affordable version available in europe? Again apologies for my ignorance, and thanks for the help - when I have more time I will educate myself properly with all the info available here! Yes, draining a pool completely can be an issue but it depends on your ground-water table. A high water table can cause problems for most pools of any type. Once it's drained you can pressure wash it to blast of the black algae "heads". They have an outer shell that is resistant to chlorine. Brushing and power washing exposes the insides so chlorine can kill it. So once its power washed you need to treat the BA with chlorine, either a straight diluted solution sprayed on and scrubbed manually, or by shocking the pool after it's refilled and brushing several times a day. I'm not going to pile on too much but I highly, highly recommend you abandon any thought of maintaining the Ecosmarte or using copper sulfate products. Chlorine and the TFP methods are all you need. Happy to help and glad you have beaten it.